Office tables are available in many shapes and sizes. When considering the purchase of an office table, it is highly important that you ensure the table is an appropriate size for the amount of people using it. First and foremost, determine how many people the table needs to accommodate. As a rule of thumb, each person should be allotted 2-feet of space, which is an ideal amount of surface space – and, will comfortably fit a standard-sized chair. Using an overstuffed chair, for example, alters this general rule (eg. an eight foot table normally accommodates eight people). In addition to considering accompanying office chairs, other factors to explore when choosing the right office table include table shape and space available, the aesthetics and image you want to portray, and added functions needed. Each person should have 2-feet of office table space. For example, an 8-foot-long table will accommodate eight people; four seated on each side. As you determine the size of the table you should purchase by looking at the number of people and associated chair space you need the table to accommodate, keep in mind that there are many options for office chairs. 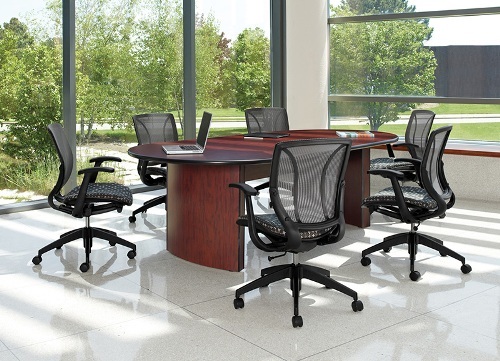 Generally, chairs that offer beneficial functions such as tilt-back or height-adjustability are popular choices. As office chairs are often shared, a chair with a pneumatic, or gas, cylinder that sports convenient paddles readily available from a seated position makes adjusting easy. You want to adjust a chair to the user's body, not the tabletop. Also, will a chair that features rollers or a sled-base work best for you? Both move easily, but sled-base chairs are often more convenient for use in smaller offices or conference rooms, or for short meetings. They also eliminate the potential for the chair to accidentally roll into walls in smaller spaces. Office tables need office chairs. Chairs should provide comfort and support so employees and guests can be more productive. As with chairs in small spaces, if you are in need of an office table for a small space, racetrack tables work well. Boat-shaped tables are better for bigger spaces as they deliver slightly more room for chairs. Round tables tend to seat fewer people, but offer a welcoming feel and are another good fit for a smaller room or private office. Training tables can create multi-purpose work areas in conference rooms, training rooms, schools or offices. These tables work well for students or shared spaces and are ideal for laptop and desktop computers as well as tablets. When positioning your new office table, make sure office doors are unobstructed. Finally, if contemporary is the office setting look you are going for, select a table that reflects that style. If you have a desired image you want to portray throughout your office setting, aesthetics can be important. Also, depending on how the table is being used, you may require enhancements, such as a folding table or a clip-top table. Many conference room tables can be ordered with grommets that allow for wire management. Others are available with built-in tabletop electrical outlets or quick disconnect outlets that allow for the easy plugging in of computer equipment or other equipment that might require a power source. Furniture series. Consider viewing the entire furniture series of the office table you are purchasing. If you are buying a drawing or drafting table for a personal office, you may want to match it with your office desk, lateral files or bookcases. If you are purchasing a coffee or end table, pair it with our full line of waiting room and reception seating. Finish and durability. Consider finish and durability options. Laminate tables offer higher durability and feature a variety of finishes and styles, while wood veneer tables sport catalyzed lacquer finishes for an elegant appearance. Before selecting "buy", ask yourself these final questions. Will this table accommodate the number of people who will use it? Have I thought about the purchase of and space needed for accompanying office chairs? Does the size and shape of this table fit well in its intended space? Will this table capture the aesthetic style and portray the image I desire? Do I need wire management or other capabilities? Ensure the table is an appropriate size for the amount of people using it. Allow 2-feet of office space per person along the side of the table when determining the size of the table to purchase. Try to allow 3 1/2-feet of space around the table. Think about the purchase of accompanying office chairs and the features you need the chairs to have. Consider the size and the shape of the table you are purchasing per the amount of space you have available. Select a table that will meet your image and aesthetic needs as well as provide added enhancements if required, such as wire management.